Dimensions Learn-a-Craft kits are perfect projects for anyone to discover the many joys of stitching. This lovely Birdcage embroidery kit features step-by-step beginner instructions that make it fun to be creative! Finished size: 6" diameter. Embroidery kit includes: • Presorted cotton thread • Printed ivory cotton sailcloth • 6" plastic hoop for stitching and finishing • Needle • Easy instruct.. Nature's artistry is displayed in this jubilant grouping of summer blossoms. This warm and welcoming floral vignette is stitched in glorious colors of wool and acrylic yarn along with cotton thread on fully printed white homespun fabric with selected areas marked for stitching. Kit contains wool and acrylic yarns, cotton thread, white homespun printed in full color with selected areas marked for s..
Sweet bird songs and the fragrance of dogwood will come to you from this family portrait of proud parents tending their offspring amidst the blossoming branches. Wheat homespun fabric is the perfect background for this tender and realistic depiction enhanced by exquisite details. Kit contains Persian wool yarn, cotton embroidery thread, design printed on wheat homespun, needle and easy instruction..
Everyone's favorite flower just might be the cheerful hydrangea. In this special treatment of the subject, brilliant yet softened hues and textures combine in the perfect design. Kit contains cotton thread, design printed in full color on white homespun with selected areas marked for stitching, needle and easy instructions. -- Finished Size: 5 x 7 (13 x 18 cm) -- Designed by: Ann Craig..
Feathers and Flora is a set of 3 embroidery designs. Three different designs of birds with flowers and frames included. Contains: Screen-Printed 50% Polyester/ 50% Cotton Fabric, 6-Strand Cotton Floss, Frames, Needle, Graph and Instructions. Size 3" x 4".. Gardening Birds come in a Set of 3. These embroidery designs are birds at their gardening best. Display them together or spread them around the home. Contains: Screen-Printed 50% Polyester /50% Cotton Fabric, 6-Strand Cotton Floss, Frames, Needle, Graph and Instructions. 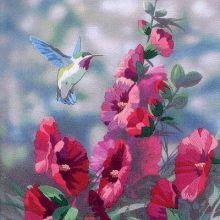 Size 3" x 4"..
Beautiful hibiscus and a dainty hummingbird comprise this exquisite crewel embroidery design. Kit contains wool and acrylic yarns, cotton thread, printed ivory homespun, needle, and easy instructions. Fabric is 16"X16". -- Finished Size: 12" x 12" (30 x 30 cm).. Stately blooms are the destination of this fascinating creature in flight. Vibrant shades of cotton thread and wool and acrylic yarn are embroidered on the fully printed fabric to create this masterpiece of nature. Kit contains wool and acrylic yarns, cotton thread, white homespun printed in full color with selected areas marked for stitching, needle, and easy instructions. -- Finished Size: 11" x..
Hummingbirds come in a Set of 3. These embroidery designs are Hummingbirds at their best. Display them together or spread them around the home. Contains: Screen -Printed 50% Polyester /50% Cotton Fabric, 6-Strand Cotton Floss, Frames, Needle, Graph and Instructions. Size 3" x 4".. It looks like opposites do attract. Shirley Deaville's animal portrait is printed in full color on white cottage with selected areas marked for stitching. The vibrant cotton threads included in the kit will bring these unique friends to life. Kit contains wool and acrylic yarns, cotton thread, white homespun printed in full color with selected areas marked for stitching, needle, and easy instru..
All things bright and beautiful come to life in this garden sampler by Dimensions. A variety of crewel embroidery stitches and dimensional add-ons make Le Jardin Sampler fun to stitch. Finished size: 14" x 11". Designed by Jill Burgess. Embroidery kit includes: • Presorted thread • Printed ivory fabric • Ribbon • Plastic pearls • Buttons • Needle • Easy instructions.. These blossoming botanicals waft the sweet smell of spring through the air. The many shades of blue and lavender in this still life are shown to perfection on the black homespun fabric. You will employ wool yarn and cotton thread to fill in areas and add details to the partially printed fabric. Kit contains wool yarn, cotton thread, printed black homespun, needle and easy instructions. Finished Si.. Simple, yet stylish, Perfect Nest by Dimensions makes a wonderful housewarming or wedding gift. Easy embroidery stitches are used to create this design. Finished size: 5 x 7. This crewel embroidery kit contains: • Presorted thread • Printed beige fabric • Needle • Easy instructions..
Winter Birds is a set of 3 Embroidery designs. Three fabulous winter birds each one with its own winter theme. Contains; Screen - Printed 50% Polyester / 50% Cotton Fabric, 6-Strand Cotton Floss, Frames, Needle, Graph and Instructions. Shown actual size of 3" x 4"..
Young at Heart by Dimensions features a plethora of posies surrounding a Greek proverb. It's worked with fun embroidery stitches using a colorful palette of cotton threads. Size: 5" x 7". Designed by Lori Siebert. © Olika Licensing Inc. / Lori Siebert. Crewel embroidery kit contains: • Presorted cotton thread • Printed beige fabric • Needle • Easy instructions..